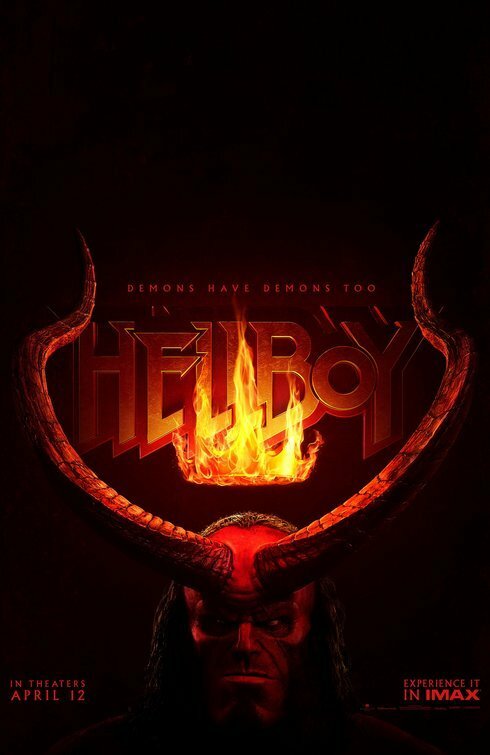 "Gross and Gruesome Supernatural Battles"
The 2019 reboot of the HELLBOY franchise is a mashup of horror, fantasy and film noir where the half-human, half-demonic title character finds himself having ethical dilemmas when an evil witch from Arthurian legend resurrects herself and offers to rule the world with him, but after they destroy the human race. HELLBOY is extremely violent, silly, overly gruesome, and even laughable and contains a strong mixed worldview with Christian and occult content and lots of strong foul language. The 2019 reboot of the HELLBOY franchise is a mashup of horror, fantasy and film noir where the half-human, half-demonic title character finds himself having ethical dilemmas when an evil witch from Arthurian legend resurrects herself and offers to rule the world with him, but after they destroy the human race. The movie opens with a prologue in 517 A.D. where King Arthur and Merlin pretend to surrender to the evil witch Nimue, nicknamed “The Blood Queen,” and her demonic monsters from Hell. Instead, Arthur beheads Nimue with his sword, Excalibur. He then cuts up her body into six pieces and buries the pieces throughout Britain. Cut to the present day. Hellboy’s adoptive father sends Hellboy to Mexico City locate a missing agent of the Bureau of Paranormal Research and Defense who was investigating a coven of vampires. The agent has been turned into a monster himself, however, and Hellboy reluctantly has to kill him. Back in the United States, Hellboy expresses doubts to his father about their war against such demonic monsters. Why not try a more peaceful method to end the war between humans and monsters, Hellboy angrily asks his father. While this is happening, a pig-like monster bearing a grudge against Hellboy is trying to locate the body parts of the evil witch Nimue so she can be resurrected, and they both can get their revenge on the human race and Hellboy. A prophecy, however, claims that Hellboy will usher in the Apocalypse. Nimue wants Hellboy to join her as her King so they can kill all the humans and rule over Earth and all the monsters from Hell. Will Hellboy accept her offer? The filmmakers try to give HELLBOY a sense of humor about the strange and sometimes gross, but often very violent and silly, supernatural happenings in their movie. Some of the humor is funny, but it often misses the mark. The dialogue and action in the script are just not very clever. In fact, they eventually become rather monotonous. Also, as the movie went along, some of the special effects and supernatural elements became laughable. HELLBOY has a mixed pagan worldview that contains both Christian and occult elements. The heroes sometimes consult with mediums and speak to dead people to find out information. Being part demon and part human, Hellboy at one point makes an argument in favor of peaceful co-existence with the demons and demonic monsters he’s fighting. This goes by the wayside, however, when the evil witch and the monsters refuse to play ball so to speak. Finally, HELLBOY has a lot of R-rated foul language and lots of extreme violence that’s often gross and gruesome. It’s not an enjoyable experience at the movies. Extreme and often gross and gruesome violence includes monster body parts and heads are chopped off, human witch’s head is chopped off twice, much blood and gore is spilled, creature is impaled, apocalyptic monsters from Hell rip apart human beings, humans repeatedly stab hero with spears, creatures fling hero around, hero knocked around by large battle weapons, eyes gouged out, monks murdered, large door smashes monk to a bloody pulp, two creatures battle it out in a wrestling ring, witch slits a man’s throat with her fingernail, etc. Man withholds information from his adopted son, and they become estranged, plus the titular hero expresses a desire at one point to establish a peaceful coexistence between humans and supernatural monsters from Hell (he’s tired of just killing the monsters). The 2019 reboot of the HELLBOY franchise is a mashup of horror, fantasy and film noir. The movie opens with a prologue in 517 A.D. King Arthur and Merlin pretend to surrender to the evil witch Nimue and her demonic monsters from Hell. Instead, Arthur beheads Nimue with his magical sword, Excalibur. He then cuts up her body into six pieces and buries the pieces throughout Britain. Cut to the present day. While Hellboy battles supernatural creatures, a pig creature gathers Nimue’s body parts so she can resurrect herself. She wants Hellboy to join her as her King so they can kill all humans and rule over Earth and all the monsters from Hell. Will Hellboy accept her offer? HELLBOY is extremely violent, silly, overly gruesome, and even laughable. HELLBOY has a mixed pagan worldview that contains both Christian and occult elements. The heroes sometimes consult with mediums and speak to dead people to find out information. Finally, HELLBOY has a lot of R-rated foul language and much extreme violence that’s often gross and gruesome. It’s not an enjoyable experience at the movies.